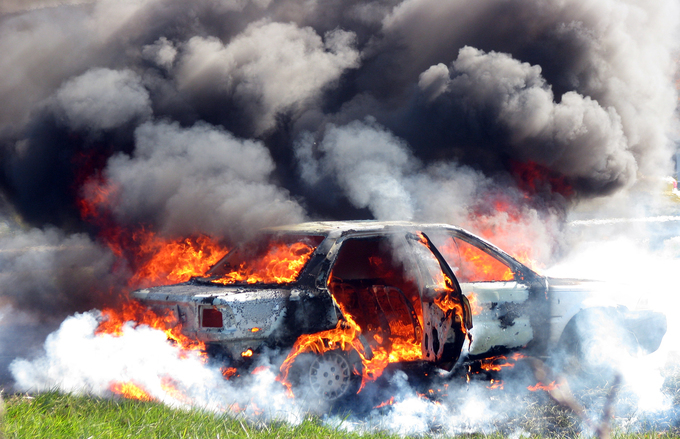 Boston traffic accidents that result in burn injuries are among those that result in the highest damage awards. That’s because the injuries sustained are often severe, if not fatal. A car is powered highly flammable gasoline and there are also various other fluids flammable and possibly combustible. Even antifreeze, which is designed to cool the engine will ignite if exposed to a sufficient heat source since it mostly made from alcohol. The car is also filled with upholstery that can burn and melt following a serious Boston car accident. There are various causes of burns such as electricity, but in car accidents, we are typically dealing with thermal burns. Chemical burns are also possible. According to a study compiled by Richard R. Edlich, PhD, FACS, FACEP, and published by Medscape, more than 2 million people suffer from burn injuries each year in the United States. In a Boston crash cases involving burn injuries, there is often a great deal of pain and suffering, depending on the severity of the burn. While many people know of the first three degrees of burn injuries, there is also a fourth-degree burn. A first-degree burn is something like a sunburn and will usually go away on its own. A second-degree burn involves some blistering of the skin. This type of burn typically requires some type of topical ointment, but will usually heal on its own. A third-degree burn involves damage to all layers of the skin and some tissue such as muscle. These burns require prompt medical attention. They will typically require skin grafts or the use of artificial skin, which can result in very high medical bills. They will also require plastic surgery once they heal to repair any disfigurement to the fullest extent possible. Many people who were burned in car accidents will be left with permanent disfigurement, and that alone is a basis for damages in many cases. A fourth-degree burn, as discussed above is the most serious type of burn and it involves a full-thickness burn that destroys all layers of skin, tissue underneath the skin, and often bone. These burns are often deadly depending on the percentage of the body that is affected. Another reason burns are often so serious is because the skin protects the body from bacteria. Certain deadly bacteria are ubiquitous in our environment, but cannot hurt us because the skin does not let the bacteria enter the body. This is why a person can get infected when they get a cut as the skin is no longer there in the site of the injury. In the case of burns, the skin can be damaged over such a large area that the body can easily be ravished by deadly bacteria. These secondary infections can be even be more serious than the burn injury and can be fatal. Patients are often kept in isolation units with positive air pressure and the cost can be astounding. According to a recent news article from CBS News Boston, bystanders saved a driver from a burning wreck following a serious car crash in Norton, Massachusetts, which is located just outside of Boston. Authorities have said the woman was trapped inside her burning vehicle on Interstate 495 after her car hit a guard rail before flipping over and bursting into flames. Those who witnessed the horrific fiery crash said it looked like something crated by Hollywood special effects artists. The Norton car accident victim was unconscious as she was trapped inside the burning vehicle. When one bystander approached the burning car and tried to pull the woman out, he saw that her seat belt had become stuck. Another bystander who had pulled over his vehicle to assist had a knife, and together, the two men managed to cut her loose and pull her out just as the car became completely engulfed in flames. Firefighters were able to able to suppress the blaze once they had arrived on the scene. Paramedics were able to stabilize the woman and give her oxygen before rushing her to a level one trauma center in Boston. Fortunately, the crash victim is expected to survive. In the case of a burn injury from a car accident, it is important to speak with an experienced attorney as soon as possible. There will likely be a lot of medical bills and other losses and the at-fault driver’s car insurance company will likely call the victim within hours, and certainly within 48 hours of the accident to see if they can talk the plaintiff or plaintiff’s family into a quick settlement before they have time to speak with an attorney. The insurance company claims adjuster will possibly offer to pay the emergency room bills, but this is not likely to be anywhere near enough to cover all the damages suffered in a serious burn injury. The insurance company adjuster will also ask the plaintiff to make what is known as a recorded statement. While the plaintiff may have to make a recorded statement eventually, as failure to do so could result in a denial of the claim based upon failure to cooperate, there is nothing wrong with telling the claims adjuster you need time to speak with an attorney. This is actually what all plaintiffs should do and they should not worry about the cost of a consultation following a serious or fatal Boston car accident, because the initial consultation should be free. The plaintiff should also not be worried about the cost of representation because these cases typically involve a contingency fee agreement whereby the plaintiff will not have to pay any legal fees unless they successfully recover in a settlement or jury verdict should the case go to trial.